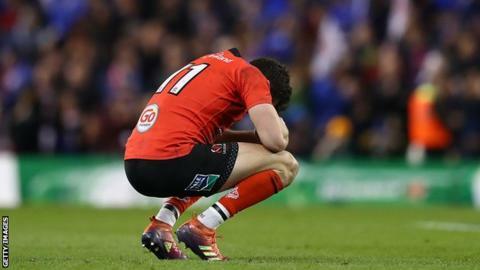 Jacob Stockdale has apologised to Ulster supporters for his missed try in Saturday's Champions Cup quarter-final defeat by Leinster. The Ireland wing, 22, dropped the ball in the act of scoring what would have been a vital try at the Aviva Stadium. Ulster, who led by two points at the time, were eventually beaten 21-18. "I've had some incredible highs with Ulster rugby, but unfortunately yesterday was a low for me," Stockdale wrote on his Instagram account. "Sport can be cruel and sometimes you have to learn your lessons the hard way. "To the Ulster fans I just want to say I am sorry, I let you down, the support we had yesterday was truly amazing and you deserve to be looking forward to a European semi-final." Stockdale is the joint-top try scorer in the Champions Cup this season after scoring six tries for his province in the pool stages and he apologised to his team-mates in the changing rooms after the full-time whistle in Dublin. Ulster head coach Dan McFarland defended his star winger, saying: "I'm proud of Jacob. Jacob played a great game and did a lot of good things. He's disappointed but that's not the reason we lost the game." In the 44th minute, Stockdale broke up the left wing and ghosted past the challenges of Adam Byrne, Jordan Larmour and Sean Cronin before beating Dave Kearney's covering tackle over the line - but the winger lost control of the ball as he attempted a one-handed touchdown. "There are not many people in the world, who can beat that many players to even get in a position where they put the ball down," McFarland added. The Ulster coach continued: "What is it? Probably three millimetres off his fingers [when he loses control of the ball]. It's a small thing but there are so many other small things that could have sent the game in other directions."